Mergify: Can house dust make us fat ? Here is a good news for all those people who are very lean and want to become a bit fat. You don’t need to pay anything but can simply sit in your room without cleaning it. No, I was kidding. But the real fact is , scientist have figured that dietary fats and other materials that make up indoor dust can send a signal to human fat cells, telling them to grow. That process, in turn, might slow the body’s metabolism, which is the rate at which it burns energy. Such changes could add to any weight problems a person might have. “What that means to long term health and certain diseases, we don’t know yet,” says Heather Stapleton, one of the study’s authors. She works at Duke University in Durham, N.C. As an environmental chemist, she studies chemical processes that occur in everyday settings. And the most important point in their research was a question. “Whether pollutants in dust might play a role in growing, global epidemic of obesity ?” If that is the case then it would be a serious problem. Rather than knowing what these people did, I guess it would be interesting to know how they did ? So these people collected dust samples from houses and offices. Some materials in the dust could turn on a protein called PPAR-gamma1. It’s found in many human tissues. Switching this protein on can cause fat cells to grow. They think that this protein may be involved in obesity. As such, pollutants that turn on this protein might be thought of as “obesogens” — a new term for chemicals that can promote obesity. In the lab, the researchers worked with cells that contain PPAR-gamma1. This protein turned on when the cells were exposed to less than a milligram of some of the sampled dust. For perspective, children may ingest around 50 milligrams of dust each day, they said. So by this experiment, we can assess how our fat cells respond to these signals. They also found out that certain pollutants shed by furniture and other products around the home, such as flame retardants, might be the culprits in dust. But a second study by those researchers now find hints that certain fats are mostly to blame. One of those fats — oleic (Oh-LAY-ik) acid — occurs naturally in many animals and vegetable oils. Cooking oils may spill some of these fats into the air, where they eventually find their way into house dust. 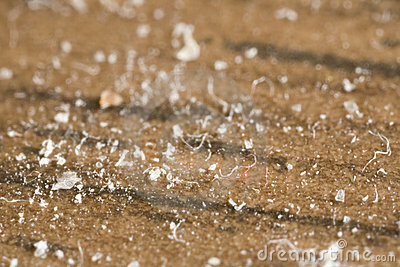 Or, the authors say, the fats might enter house dust as part of the hair or skin cells shed by people or pets. So, I would like to conclude that there is research still going on this topic and these are just few results derived as of now. Anyway, the fat one consumes in diet, which includes both normal meal and fast foods is far more compared to this. So, if someone has planned to sit idle in room, I’m sorry but it is of no much use.